I'm hating myself right now. There wasn't any obvious signs, but this entire week I just knew in my gut that some thing was wrong. In terms of growing weather, the weather has been very good all week, but both of my plants just haven't looked right. Leaves were flagging more than usual on the 282 plant (this plant wilts much easier than the 1985 plant), my kids plants had some burnt leaves near the vine tips and the 1985 plant's leaves just looked a little off to me and growth seemed to be slowing down. I was starting to wonder if all of the plants had some kind of disease, but there wasn't any real obvious indications as such. Today I figured it out, but it had to hit me in the face. Went out to the patch and plants looked like the picture to the left. That is the 282 plant. 1985 wasn't quite as bad, but both of the kids plants leaves looked like folded umbrellas. I immediately I turned the water on. I knew it was either lack of water or the plants were going down from a disease. It couldn't be anything else. Within a few minutes I had the answer. Lack of water. I have two different irrigation systems. The first comes on around 5:30 am and waters the plants under the canopy using a Dan Micro water system. This gives the plants the majority of their water. The other is an over the head sprinkler system that doesn't really water the plants much, but it mists the plants every 15 minutes to cool the leaves during the heat of the day and keep the humidity up a little. I'm not sure what is going on, but the under the canopy watering system hasn't been working. I'm not sure why, but I think this has been happening all week. I've manually water under the canopy, off the timer this week when I've seen the plants wilt a little but I've assumed that it was going off each morning. I don't have to do much vine burying these days so I haven't been in the dirt much. I'm really upset with myself for not watching the water more closely, but I've never had problems with it in the past. The damage from this probably won't just be lost pounds, but I would guess that deformaties will have formed in the 1985 plant from the lack of water and there will be some damage to the leaves. I'm lucky the pollination on the 282 hadn't aborted. The 1985 pumpkin had a circumference measurement that was four inches behind that of my 1421 pumpkin last week on the same number of days after pollination, but it was staying 4 inches behind. That meant that although it started out a little slower than the 1985 it was keeping pace with it, which was impressive. Then this week the growth started falling behind. I wasn't sure if something like a disease that was causing problems or if the 1421 just really took off at this same point. The answer was neither. I was dehydrating the plant. I'm on day 28 for the 1985 pumpkin. Usually between days 26-30 a pumpkin really takes off in growth. 35-45 pounds a day is not unheard off. I'm hoping I can get back to if I haven't screwed things up too much. I've done a very good job this year with my fertilizer program, but you have to keep your eye on the balls for everything and not just one thing for pumpkin growing. Gave both plants a foliar application of seaweed, humic acid, B-vitamins and yucca this evening. B-vitamins and seaweed are good for stressed plants and help build resistance. Plants are looking back to normal now after a good application of water this afternoon. Interesting thing starts happening to the pumpkin plants this time of year. It isn't something you can actually see, but an opportunity if you know what to do. Plants and the soil biology have a symbiotic relationship. The plant roots give sugars to the biology in the soil and in return the biology gives the plants nutrients in a form that they can use. 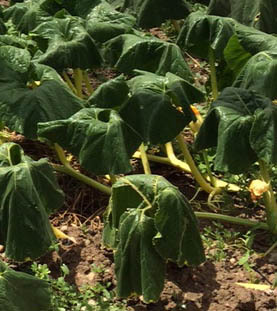 However, as the pumpkin starts kicking into gear and demanding a lot of the plants energy, the plant can start getting stingy with giving sugars back to the biology. The opportunity at this time of year is to give the plants some RAW Cane Molasses which can give the biology the sugars they need, while they continue to feed the plant. This keeps the soil activity going late into the season. This evening I did a soil application of nitrogen. Most of the application was to the 1985 plant since I just recently pollinated the 282 plant. On the ground I sprayed a mixture of RAW Nitrogen, RAW Cal/Mag and RAW Omina in spoon feeding quantities. I saw how fast acting the RAW Nitrogen was this spring and I don't want a big spike in growth at this stage. However, I do want to make sure the plants have adequate nitrogen to power growth for the pumpkins and I've given the plants very little nitrogen over the last month. To the right is a picture of both plants. In the far distance you can see the tarp that is covering the 1985 pumpkin. This morning I noticed what might be gummy stem blight on some of the leaves of the 1985 plant. Not sure if it is that or just older leaves that got beat up in our 94 degree days this week. I couldn't find my fungicide so I sprayed an application of Actinovate on the leaves of all of the plants until I can find some more time to dig around for my fungicide. Gummy stem blight shows up as brown spots on the leaves that looks a little "gummy." It can be a real problem if not controlled. The TKO that I sprayed a couple of days ago should help to control it some, but I need a real fungicide to keep it in check. Although, I'm not 100% sure if that is what it is, so I'll also watch the plant to see if more of it shows up. This morning I gave both plants some granular kelp (0-0-1.5). Kelp is a great source of hormones, potassium and micro nutrients. Application rate was fairly small. About 1/2 pound for the 1985 plant and 1/4 pound for the 282 plant. I have some kelp mixed in with my myco that I put down at each leaf node as I bury the vines, but vine growth is pretty minimal these days as most of the vines are terminated and majority of the kelp application was done in the areas of the earliest buried vines. I'm going after a big pumpkin on the 1985 Miller plant. Ada the pumpkin is growing nice, but I gave it a little nudge this evening with a foliar application of TKO. I haven't used TKO in the past, but one of the RMGVG club members gave me some during the off season and I've wanted to try it for years, but it is kind of expensive. TKO is a good source of potassium, but also contains phosphites that can help ward of disease. The 1985 will be getting into its rapid growth phase so the extra potassium should help satisfy the pumpkin as it starts ringing the dinner bell. I discovered last night that the 1985 plant has been getting under watered. A setting on the under the leaf canopy irrigation system on that line was off so it wasn't getting nearly the water that it should have. I'm impressed with the growth of the pumpkin on that plant knowing that. It will be interesting to see how it does, now that it is getting more water. The 282 female may be opening tomorrow morning. Might finally be getting a pumpkin on that plant. I sure hope so. In preparation for that, in the fertigation bottle I put some calcium, RAW Full Up, RAW Humic Acid, just a little RAW Omina and RAW Yucca. Like I previously mentioned, the goal with this is to help get calcium into the fruit in the first 10 days after pollination. This evening I gave both pumpkin plants a drench of compost tea. This compost tea was mostly made from alfalfa pellets which is a good source of hormones. I also put in a teaspoon of liquid seaweed and RAW Silica. Just before application I put in some RAW Omina into the brew. That should make the plants happy. Okay, this is one of those boring posts. Did a foliar application of multi-mineral on both plants. Blah, blah, blah, blah. The reality is that part of pumpkin growing is being consistent and giving the plants what they need when they need it. Had a really interesting conversation with Bryant of urbanfarmcolorado.com on that very topic. If you ever want a fantastic raised garden installed (or any other type of garden for that matter), Bryant is your man. 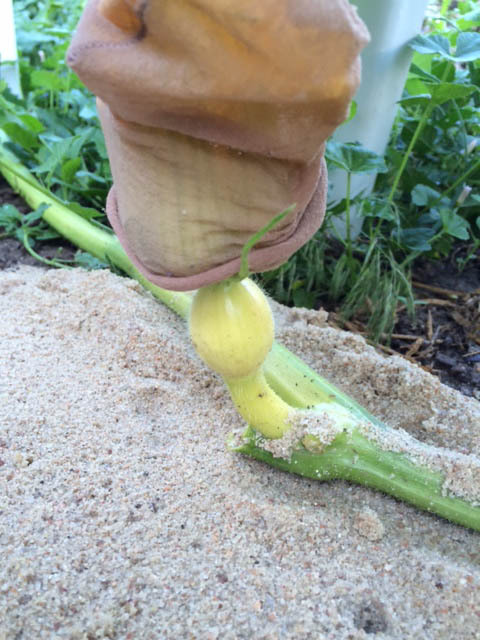 Outside of a select group of giant pumpkin growers and soil scientists, Bryant knows about as much about growing as anyone. The cool thing is that he isn't afraid to think out of the box and try new things. He has some interesting ideas that he has the wheels turning on for plant and soil testing for optimal fertilization. If he can get the ideas to work I'm the first one in line to buy the contraption. Went out at 6:30 this morning to pollinate the 282 Scherber pumpkin plant and the following is what I saw. All of the flower petals were gone including the mesh bag covering the petals. I believe the young dog at my neighbors house must have ate it off. Next female is about 7 days away. I can't believe the bad luck I've been having with this plant. Thanks Joe & Lisa! Finally a Pumpkin Pic. I've been in Canada for the last 8 days with my wife's family having a very nice time, but missing the pumpkins. Joe was good enough to watch my plants again while I was gone and did some pollinations for me while I was away. Very grateful for that. My sister also helped with watering the plants in my absence. A big thanks to both of them for their help. The 1985 plant ran wild while I was gone. Vines have popped up all over the place. I was expecting that. After terminating most of the plant, the stump had a lot of new growth popping up prior to my leaving and although I took all of that off before going out of town I knew that plant was looking for places to put all of its stored energy. I'm hoping it can focus that energy into pumpkin growing and if it does we should be good shape. This is the 1985 pumpkin named Ada after my niece. It is 16 days old now and about about beach ball sized. I like the look of that stem and the shape of the pumpkin. The 282 plant will be pollinated tomorrow morning. A month behind schedule so I'm praying this pollination takes. Never would have thought we would be this far into the season without a pumpkin on the vine on this plant. I've got a gut feeling this one could make up for lost time, but we are too far into the season now to see a state record off of this plant. 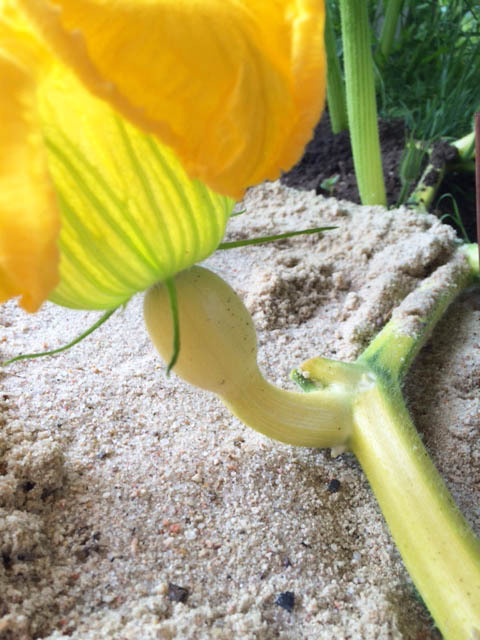 I plan to pollinate it with my son's1689 Daletas which has a nice pumpkin growing on it. This evening I gave the plants a foliar application of fish & seaweed with some RAW Humic Acid and Yucca. The pollination didn't take on the 282 plant. It will be another four days until the next female is ready. A real bummer. Have to hope that this one takes and we get a real mild September/October. I continue to fertigate with the mixture of humic acid, omina, fulvic acid, and potassium. Below are pictures of the 282 Scherber and 1985 plants. The 282 is looking from the stump end of the plant and the chair (about 25 feet out) in the distance is where the pumpkin is growing. The 1985 plant is looking from the side with the stump on the left. We've had 3 days of very cool weather with heavy rain here in Denver yesterday. Nice pumpkin growing weather after today however. This evening I gave the pumpkin plants some RAW Omina, potassium, B-vitamins, Full Up and Humic Acid. I'm using fertigation now for these kinds of fertilizers so I can give a small trickle of fertilizers to the plants through the irragation. That allows me to fertilize more evenly and saves me some time. After all the rain the 1985 pumpkin has really shined up and started to grow. With warmer weather ahead, I'm hoping it will really put on some weight this next week. Also sprayed some insecticide on the plants. Got this one in, just under the wire. The latest pollination I've ever had for a competition pumpkin was July 10th. That was my rookie year. 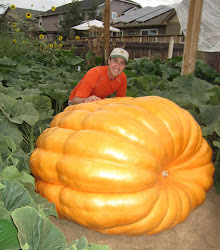 That pumpkin ended up at 755 pounds. Finally got a pollination that will hopefully will be a keeper on the 282 Scherber plant. Unlike the last one, this one has a good shape and four fully formed lobes. Today I took off the pollination on the 282 Scherber plant. 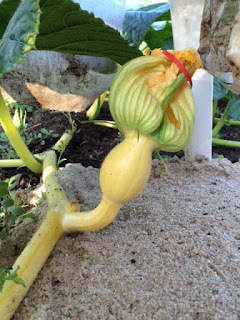 Hated to cut it off because I think it would have been my biggest 10 day measurement ever at its current pace, but when I took off the flower petals yesterday it was obviously herniated and as the pumpkin grew it would have easily blown. Next pollination is going to be about 5-6 days. Weather is going to cool down in Colorado over the next few days with a descent amount of rain, so I did a foliar application of multi-mineral with a touch of RAW Full Up (fulvic acid), RAW Grow and RAW Yucca. I'm doing something a little different this year. In the past I would have never gave any fertilizer to the plants at pollination time, but this year I'm trying to read the plants and just give them what they need. Maybe a little riskier, but I think it could yield better results. This evening I did a foliar application of fish with a little TKO and RAW Yucca in it. Both quantities were small (1 tsp of each) so I'm hoping it will just nudge the pumpkins along rather than abort them. Temperatures in Denver were nice today but it is going to be 95 degrees tomorrow. Will be putting down extra water for that. Unfortunately the well was down today so I can only do overhead sprinkling right now which isn't ideal because you end up with big dry areas because the big pumpkin leaves act like umbrellas so the watering is very uneven. This morning we had two females open in the pumpkin patch. I gave both of the females about a 30% chance of opening this morning, but they both popped open today. The way you know if a flower is going to open the next day is you see the flower elongate and the petals start oranging up the day before. Sometimes however, they don't orange up a lot the evening before so you have to be prepared just in case they do open. That was the case with both of these flowers. There was a hint of orange yesterday evening, so I went ahead and covered each flower so bees couldn't get at them and then I cut off some male flowers that I put in water and took into the house. This morning at 6:30 (I'm dedicated even on a holiday) I went out into the patch and both flowers were opening. I took the petals off the male flowers and then rubbed 3 flowers stamen on the inside of the flower. If you look closely at the 1985 Miller flower below you'll see it covered with pollen. After pollination I recovered each flower. I have a yard chair that I put over each female flower about a week before pollination. That is to help keep it cool. I'll keep that chair in place until the pumpkin won't fit under it anymore. I'll also cover the pumpkins, once they have laid down on the ground with a piece of polyester, white cloth. That will help keep the pumpkin from getting sun burn and also keep a curious bird from pecking at the pumpkin which I've had twice before. The 1985 Miller pumpkin's name is going to be Ada. The 282's pumpkin will be named Berkley. Each named after two of my nieces. The 1985 Miller was crossed with the 282 Scherber and the 282 Scherber was crossed with the 1985 Miller. Called a reverse cross. The 1689 Daletas is a seed that my son is growing. We crossed the 1689 with the 1985 Miller, which is my best looking plant so far. Don't tell my wife that the flowers aren't for her. Giant pumpkin growing is all about mitigating risk. You have to do everything you can to anticipate and avoid problems in the pumpkin patch. Although some problems you can't do much about. The 2nd female on my 282 plant's main vine didn't show up until 20 feet out but I was happy to finally be able to pollinate it today. Although I saw a problem about 4 days ago. The flower petals where off to one side and not at the top of the pumpkin. I knew this couldn't be good. When I opened the flower to pollinate with pollen from my 1985 plant my fears were confirmed. 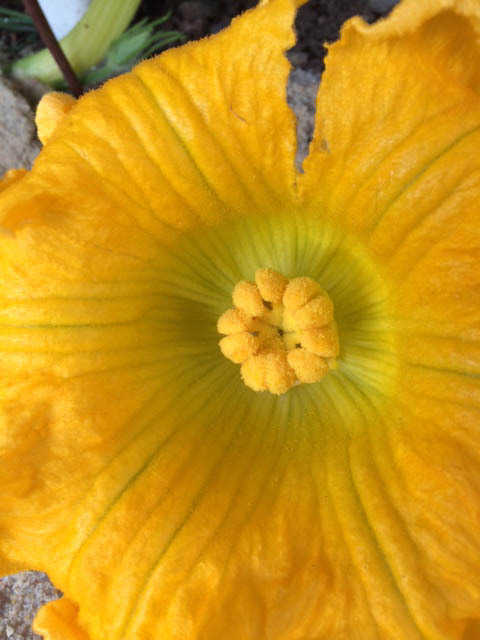 The segments of the flower aren't uniform which means the pumpkin won't be uniform. An uniform pumpkin has a much greater risk of the pumpkin splitting. There is another female that won't be ready for about another 10 days so we will pollinate it as well and hope for something better.